Follow Me.Wake up, sheeple, it's Good Shepherd Sunday! - Follow Me. Wake up, sheeple, it’s Good Shepherd Sunday! A Reflection on the readings for the Fourth Sunday in Lent (Good Shepherd Sunday), Year C.
Were you in John’s vision? Did he see you there in heaven, praising the lamb, free of all suffering and fulfilled in every desire? Were those you love there? Those people around you, whom you influence with your words and actions? All that we desire for ourselves and those whom we love finds its fulfillment in this: remaining in Christ. We spend so much of our existence on earth seeking the things that Jesus, the Good Shepherd, desires to give us. And we spend so little energy simply trying to remain in him, or, if we have fallen out of arms, asking him to pick us back up. If we take Jesus’ promise seriously when he says, “They shall never perish; no one can take them out of my hand,”then most of the “problems” in our life wouldn’t be problems anymore. The main problem – the only permanent, truly tragic problem would be sin. Because sin is the the willful choice to leave the arms of Jesus the Good Shepherd. And sin is the only way that we can leave his arms. To get to heaven is to remain in the arms of Christ, the Good Shepherd. 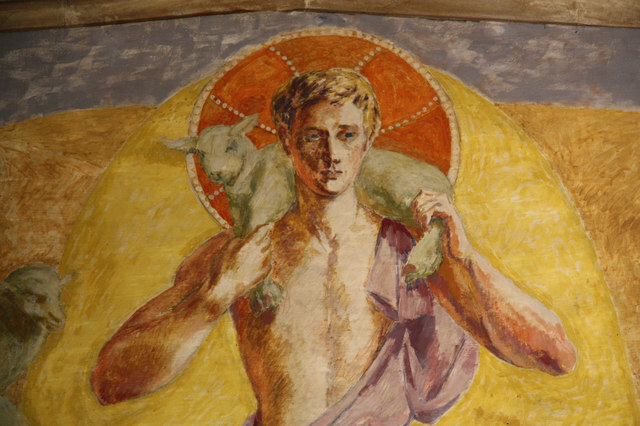 To remain in his arms is to participate in the sacrifice of Christ the paschal lamb. To participate in the sacrifice of Christ the paschal lamb is 1) to believe in him, 2) to be washed in his blood, 3) to listen to his voice and follow him wherever he goes. Our lives are meant to be spent in worship of Christ. This doesn’t just mean acknowledging his existence, or even just coming to Mass. It means an ongoing, intimate relationship with him as the one who cleanses us, nourishes us, protects us, and sustains us. It also means an ongoing relationship with the other members of his flock, and a desire to always increase that flock. 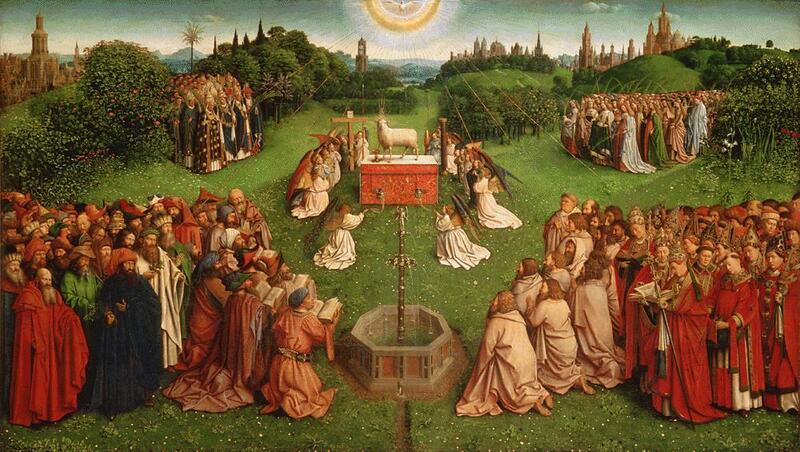 Each sheep can draw others to the flock, and to eternal life. That is why Paul and Barnabas quote God’s promise made through Isaiah: “I have made you a light to the Gentiles, that you may be an instrument of salvation to the ends of the earth.” This promise is fulfilled in us, the baptized, each of whom is an “instrument of salvation.” And through us, as through Paul and Barnabas, “all who [are] destined for eternal life” will come to entrust their lives to Christ the Good Shepherd – if we ourselves remain faithful sheep. Often we spend our time, focus, energy, and resources on looking for the very things that Jesus wants to provide for us. Sometimes this is sinful. Other times it is just mistrustful of Jesus. Either way, it doesn’t lead to the eternal fulfillment and security that the Good Shepherd offers. But what would it look like if we spent ourselves primarily on remaining in his arms (and on keeping those we love in his arms)? How would our life look different? I know that I wouldn’t worry as much. I would be quicker to turn to prayer when I am frustrated, and spend more time thanking and praising Jesus. I would follow his moral teachings not out of fear, guilt, or impersonal duty, but because I never want to leave his arms. Temptation wouldn’t be something to fear, but an occasion to grow in trust. I wouldn’t even fear sin in the same way that many do – due to punishment, or a prideful self-focus. Rather, I would fear it the same way that I fear being separated forever from those whom I love. And when I do sin, rather than wallowing in the mud, I would look right up at Jesus the Shepherd and ask him to pick me up again, with no fear or anxiety. I would speak more freely and openly about Jesus. And when I am persecuted for speaking about him, when I encounter “jealousy” and “violent abuse” like Paul and Barnabas, I would, like them, continue to speak out boldly with the confidence that nothing can take me out of the hands of Jesus Christ. These seem like the characteristics of a saint. And they are! They are the characteristics of those who have survived the tribulation, are clothed in the white robes, who no longer hunger or thirst or cry. These are the characteristics of those who have Jesus as their shepherd and sacrificial lamb – those in heaven! So if John did see us in his vision, it wasn’t because we did great things in this life. It was because we held on to Christ the Good Shepherd and trusted him. If those whom we love are there, it’s because we were unabashed in speaking to them of Jesus and his promises. 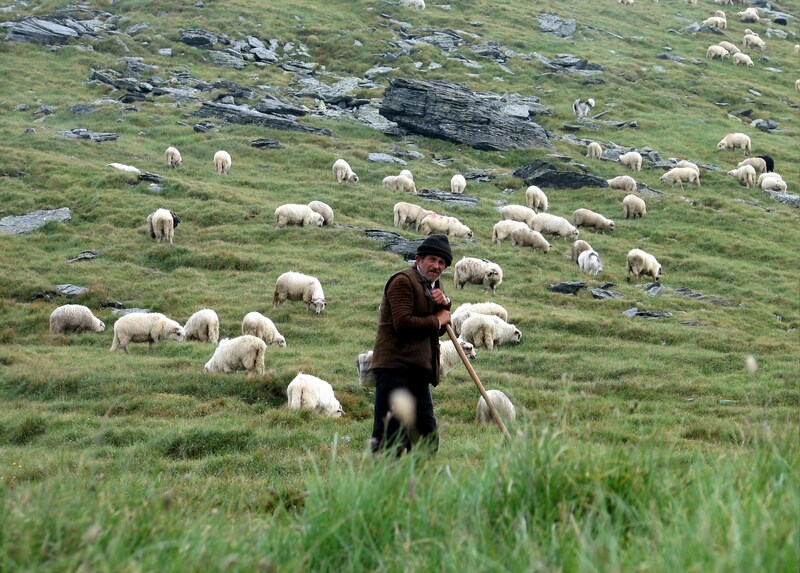 As a priest, I am not only one of Jesus’ sheep, but I am also a shepherd after his own heart. I am also meant to be in union with him as the sacrificial lamb, because the priest is also the victim. One of my deepest joys is welcoming new sheep into Jesus’ flock, because I know what he has done for me and I am confident he has the same love for them. It is just as joyful to welcome people back into the arms of Jesus after they have fallen away in sin. Washing them in the blood of Christ, I am confident that their baptismal dignity is restored, and I often see it on their faces and hear it in their voices. I am privileged to lead God’s sheep in the worship of the lamb around the throne of the altar, and to be the hands and voice of Jesus guiding his sheep through the shadow of the valley of death into eternal life at the end of their time on earth. Please pray for more priests to be shepherds and victims after Jesus’ own heart. Invite young men around you to consider the call, and reassure them that, if Jesus does call them, it is as fulfilling of a life as one can have this side of heaven. May Jesus the Good Shepherd keep us all in his hands, and I pray that we will see each other in white robes, praising the lamb and following him to the springs of life-giving water forever.